barrel will be turned to slip neatly into .12ga single external hammer gun. plenty of cast projectiles at reasonable cost...60ish cents each. how much freebore should we give chamber???? 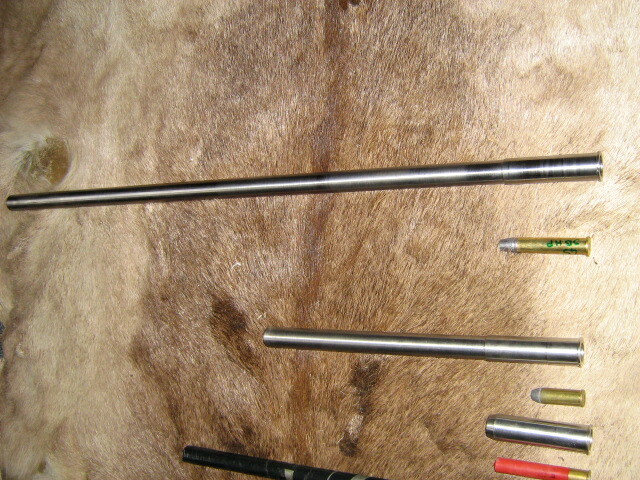 is a long weatherby type one going to be advantage and maybe keep pressure down??? rough measure of case looks like 12mm is spot on..... for freebore that is. For barrel specs, Deer Sniper would probably be the man mate. As for loads, Gelan has done quite a bit of development in that area as well. Elvis, I think one concern you will have is what load data to use. There are 3 different load databases for the 45-70: Trapdoor, Lever, Modern. Your 1000 t0 1600 fps is a significant energy spread and is covered with the trapdoor load profiles. Is a shotgun receiver strong enough to cover rifle pressures? I rebarrelled a 1869 Remington Rolling Block that used black powder cartridges. I've been shooting 405gr lead bullets. I went with the lowest chamber pressure I could. I started with a minimum load of Varget but had too much unburned powder left in the barrel. I then switched to H4895 which burned much cleaner and can be used for lighter loads. I had to buy felt wads to talk up the extra volume in the case so the powder stayed up against the primer. Trailboss actually is higher pressure than these two powders. You might consider one of the Barnes 458 SOCOM bullets if you don't want your game to run very far. I've heard reports of heavy 45-cal bullets not anchoring game where they have been hit. The Barnes bullets expand significantly and are very effective. Maybe worth the price. But, the bullet you use may determine the freebore you want. You certainly do not need to keep the bullets loaded long for case capacity. ok thanks for that Slim..... trailboss is mentioned as 13grn?? will put it right about subsonic barrier the data is there for it so an option. will feed her cast cast and more cast.... the possibility of running a hollow base BACKWARDS is another Ive considered as feeding from magazine wont be an issue. there is a great thread on another forum with chaps running it subsonic with devastating results on goats,fallow etc...big hole in animal even without shock from velocity....only time and experimenting will tell. the 1000-1600fps is a long way apart agreed just looking at minimum that would work and up to what max for pressure etc will be....it might be 1300fps tops it out in the action....... long term if I shoot the action loose its no biggie as I have another the same elsewhere and worst cast senario I turn barrel down a fly turd more and run it in a bakail......cheap either which way so not a big worry...cant see the barrel/chamber bit being affected unless I do something really dumb...I also cant see me wanting to stoke loads up too much and get high recoil etc when biggest animal its likely to be asked to drop will be a red deer or pig and sub hundred yards. Elvis, you better start thinking completely different! Recently I got my hands on a Wesson & Harrington Buffalo Special (in 45-70). I also started with smokeless powders and hard casted lead pills... untill I tried black powder and soft lead! And don't worry about cleaning. I don't wash with hot soapy water anymore. Just a few patches Birchwood N° 77 black powder solvent, then a brass brush and a few dry patches afterwards. I deprime my cases, put them in a container, add boiling water and then some Oxy-fix washpowder. Dirt just bubbles out of the container... rinse with hot water and let them dry. And yess, this Buffalo Special has the looks of a cal. 12 single shot when you remove the optics. 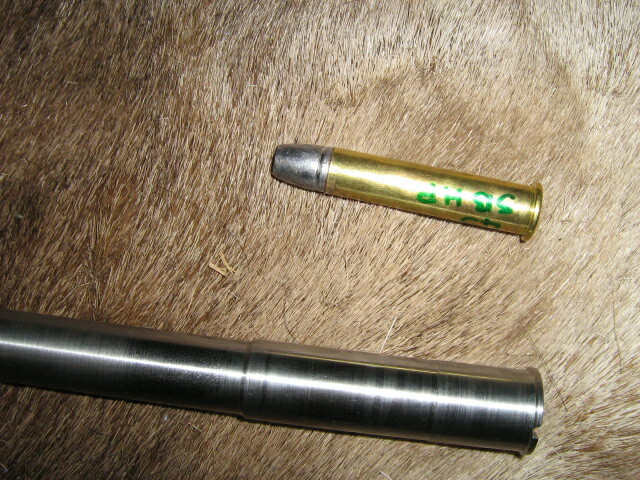 And I used 60 grs blackpowder for that bullet at first, but then I had to clean the barrel every 5 shots or so. That is why I had to use the fiber filler wads with smokeless powder. good info Aloys...I might just bug you for more info later on.... and the cast lead is soft...the guy who makes them is a guru...Ive been using his 151grn .308 for a couple of years with great results. this is the first and possibly only project rifle I will ever build...dont really need it as can do what it will do with what Ive already got BUT it CAN scrath the black powder and big bore itch and will be something completely different. got my projectiles yesterday....man they look huge....loaded up a couple just to see whats what,pushed one through barrel to "slug the bore" and triple check spec's tis all good so mate is onto the final stages now...wont be long but will still be too long. correct me if Im wrong but a 100grn pill doing 3000fps will have same theoreticle energy as a 300grn pill doing 1000fps???? I cant see me needing to push these along now Ive seen how big they are,they going to leave a big hole for the red stuff to flow out of. Elvis, all this good work and no pictures to go with it. Can you remedy that? 300 grains isn't that big for the .45-70. I shoot 400 to 500 grains which kick pretty good. Energy is a function of velocity squared so the 100gr bullet at 3000 fps has 3 times the energy as the 300gr at 1000 fps. They both have the same momentum, however. 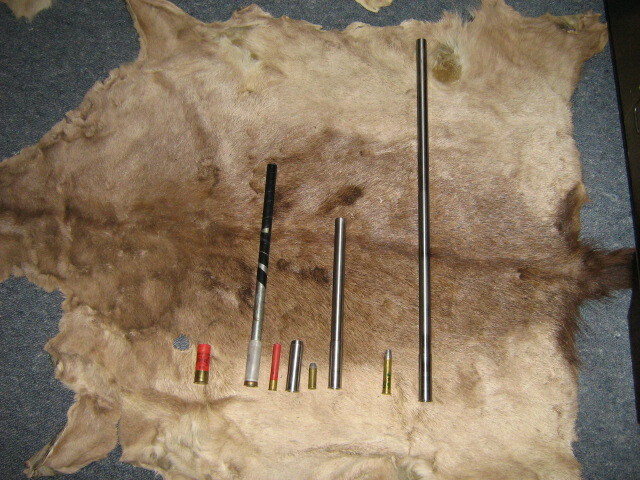 Elvis, I had good results with Accurate 5744 powder and 400 grain cast bullets in my Marlin .45-70s. No filler used. thanks for clearing that up Slim...Pumpkin its good to hear the 400 grn range is where its at...sitting on my reloading bench are 25 x390 grain hollow base soft cast projectiles and 25x 413 grn cast projectiles...how do I know they are soft??? cause one base got dented in transit,cut that one in half to remove the dented base and slugged it through bore. reading a bit more has me wondering wisdom of trying trailboss at all.... the figures show a much faster load with 2208/varget will be at much less pressure...... guess thats purely down to speed of burn but as this rifle will be a low pressure jobbie I best take note and be cautious. Varget had the lowest pressure (by the book) when I developing my loads but left unburnt powder in the bore. Will be interesting to see if your experience is the same. so She lives..... it works and works well. crude shotgun bead sights are going to be biggest hurdle to accuracy but as I intend this to be short range (sub 50 yards) bush gun and wet weather gun thats not going to be a big deal...If grouping/first shot can be consistantly poked into minute of bucket/milk bottle it will do the job. 45grns of 2208 looks like a go,they start to cheek slap so will be upper limit for now at least.photos dont do justice to the amount of hours Rumpy put in on lath to get this bull barrel down to a working insert. Nice, Elvis! Have you considered soldering on a picatinny rail for a low power or scout scope? easy to attach or did I miss that this slides into a .410 shotgun bore?